Stone statues play a prevalent role in Japanese life. You see them at Buddhist Temples and Shinto Shrines, and you also see them in front of houses and businesses or in gardens as decoration. Ditto at cemeteries. 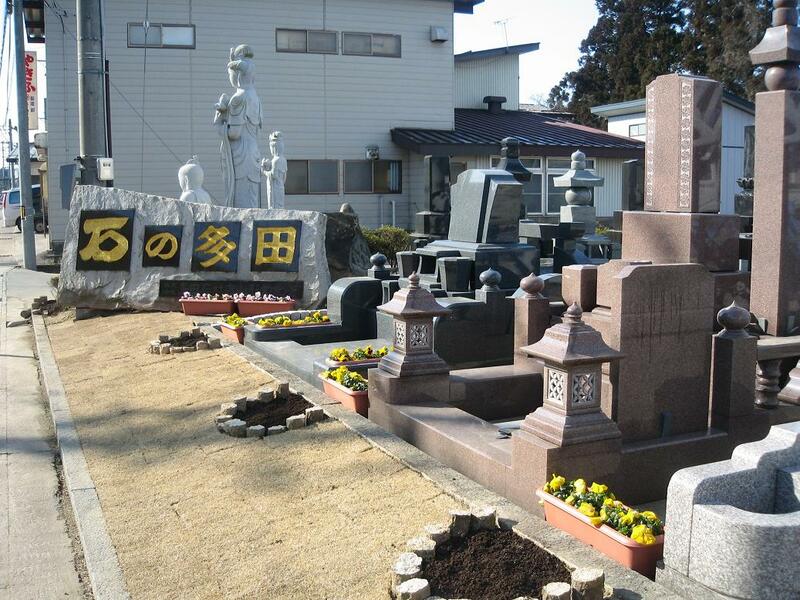 Japanese stonemasons are called "sekizaiya-san" (石材屋さん) or "sekizaiten" (石材店). They primarily focus on carving grave stones. The vast majority of Japanese are cremated, and in most areas, you must legally be cremated. However, a small percentage of people in the countryside are buried in the ground. Graves consist of a large stone that sometimes looks like an obelisk on which the family name is carved. Stone craftsmanship is, thus, of the utmost importance, and to show off their abilities, sometimes stonemasons carve out much more than just tombstones. There are the usual Buddhist and Shinto stone statues, which are found in temples and shrines, or used as protective markers on roadsides (more here). Next to the Buddha statues, there might be cute traditional yokai characters like the tanuki. Or, occasionally, you might spot newer characters, like Pikachu from Pokémon or Mickey Mouse. 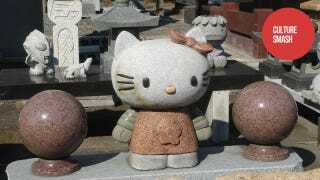 People in Japan, too, are sometimes surprised when they happen upon, say, Hello Kitty or Ultraman carved in stone. A few times I've actually seen stone versions of cartoon characters at shrines and temples. They certainly weren't placed in places of worship and were used more in a decorative sense in the garden, much like a garden gnome in the West. They're there simply because someone likes the characters. However, for a country that has traditionally placed statues of spirits for good luck, stone statues of today's mythical creatures, whether that's Pikachu or Godzilla, don't seem all that out-of-place. They're modern day folklore.